412 pages | 24 B/W Illus. 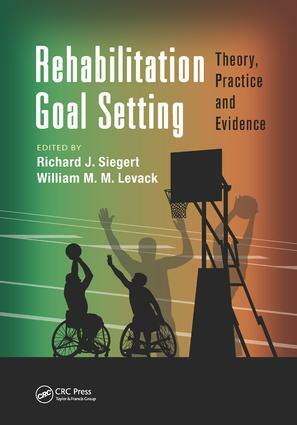 Written to provide clinicians, educators, researchers, and students in rehabilitation with a comprehensive overview of the theory, practice, and evidence base of goal setting, this first-of-its-kind reference provides an authoritative, state-of-the-art knowledge of the practice. The authors cover a broad range of different approaches to goal setting, with input from experts from North America, Europe, and Australia. This book is applicable to patients with stroke, traumatic brain injury, neurological disorders, spinal cord injury, and other conditions. "… up-to-date, evidence based, and client and family centred. It will help clinicians to work with clients to make their rehabilitation goals more meaningful and achievable, thereby leading to more effective treatment planning and outcomes." "… a unique and important contribution to the literature. … [covering] a wide variety of relevant topics. … [The editors] have assembled a substantial group of authors, especially from the UK and New Zealand. A worthy endeavor." "Goal setting is used in just about every service, but it is something that is done in many different ways. This book provides the theory as to why goal setting should be used, as well as discusses how to use it in a wide range of clinical services. Therefore, this is definitely a book that everybody who works in a rehabilitation service should read. In fact, all rehabilitation teams should probably take the opportunity to read this book and review their practices having done so!" Richard J. Siegert, BSc, PGDipPsych (Clin), MSocSci, PhD, is professor of psychology and rehabilitation, Person Centred Research Centre, School of Rehabilitation and Occupation Studies, Auckland University of Technology, Auckland, New Zealand. Siegert trained in clinical psychology and completed his PhD in psychology at Victoria University of Wellington. His research interests include neuropsychology, neurological rehabilitation, psychology applied to rehabilitation, and psychometrics. Siegert is an author of 90 peer-reviewed journal articles, four invited articles, six book chapters, and a popular undergraduate rehabilitation textbook. His current interests include the application of mindfulness techniques for people with neurological conditions and outcome measurement in neuro-rehabilitation. William M.M. Levack, BPhty, MHealSc (Rehabilitation), PhD, is associate dean for research and postgraduate studies, and senior lecturer in rehabilitation, University of Otago, Wellington, New Zealand. In 2003, Levack was employed as a lecturer at the University of Otago, teaching interdisciplinary, postgraduate courses in rehabilitation by distance, and in 2008 he completed his PhD. His current projects include work on the development of a clinical measure of loss and reconstruction of self-identity after traumatic brain injury, qualitative research into the barriers and facilitator of access to evidence-based rehabilitation, and the use of kinetic video games as a form of therapeutic exercise for people with chronic respiratory disease.